Home CDN , children , crafts , feature , holiday , holidays , homeschool , March , papercrafts , printables , US , worldwide March 9th - Featuring Barbie Freebies! March 9th - Featuring Barbie Freebies! -- A required resource for all Barbie® collectors, this completely revised and expanded edition features new images and updated prices, all in a handy, easy-to-carry-along format. 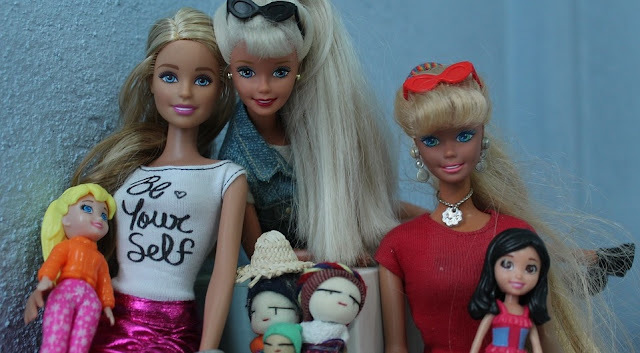 Now over 1,200 beautiful color photos illustrate this complete listing of Barbie through her vintage years from 1959 to 1972, including her sister Skipper® and their friends, relations, and pets. Ken®, Midge®, Allan®, Francie®, Scooter®, and all the rest are here. Never before presented in such detail and with so many images, every picture shows all the pieces originally included with the fashion. • Barbie Careers Dolls -- Explore news-related careers and be in front of or behind the camera with this TV new team set. The news anchor doll is ready to broadcast the latest news in a rose dress, matching shoes and a blue necklace; a microphone helps her report. The camerawoman doll can follow the story in a cool blue shirt, denim pants and brown boots; a camera, headset and press pass help her capture it all on film. • Handmade Clothes Outfit for Barbie -- 10 sets different clothes and 10 pairs of shoes satisfy your child's dressing fun. Children can dress up dolls according to their preferences which will enrich their imagination. Give these doll clothes for Children's Day, Birthday, Holiday and fun party favors to little girls and teens. Your kids will love them! - Hopefully, everything is going just swell in your life, and you have no need for this day. But, if problems and troubles are looming, try to hold off hitting the panic button until this day arrives. Don't worry. Don't fret. And, above all, don't panic. However, if ever there was a day to panic, today is that day. Run around all day in a panic, telling others you can't handle it anymore! - A day dedicated to crab meat and all of the recipes it is related to, such as crab cakes and crab bisques. The Blue crab is a type of crab commonly used for the production of processed crab meat. The annual amount of blue crab harvested from the Chesapeake Bay makes up fifty percent of the total landings in Maryland's commercial fisheries. - This day celebrates the Battle of Hampton Roads (March 9, 1862), the first battle between armored ships, the Monitor and the Merrimac (the Virginia). - Joe Franklin (born March 9, 1926) started in radio when he was 17 years old, as a record librarian at a New York City's WNEW. Even then, he knew his oddball trivia, and the station soon gave him a 15-minute show dedicated to nostalgia about vaudeville. Franklin started in the new medium of television in 1950, pretty much inventing the talk show. The Joe Franklin Show was the longest-running talk show in TV when it ended in 1990, though it has since been eclipsed in longevity by The Tonight Show. Franklin says he did more than 28,000 episodes of the show, which works out to about 1.9 episodes per day over 40 years, so it must be the longest run for one show with one host. - Based on the idea everyone has SOMETHING to get over. It is the day to finally get over that ex-boyfriend or ex-girlfriend, those stressful school- or work-related issues, any fears, insecurities, embarrassing moments, bad relationships, etc. If you're not sure what YOU have to get over, just ask your friends what they're tired of hearing you complain about.